A nice group of photos, Bob. We’re in Tacoma WA now visiting our son. They are expecting a new baby any day. We are staying at a beach front house. Kingfishers fly by now and then. They are fun to watch. 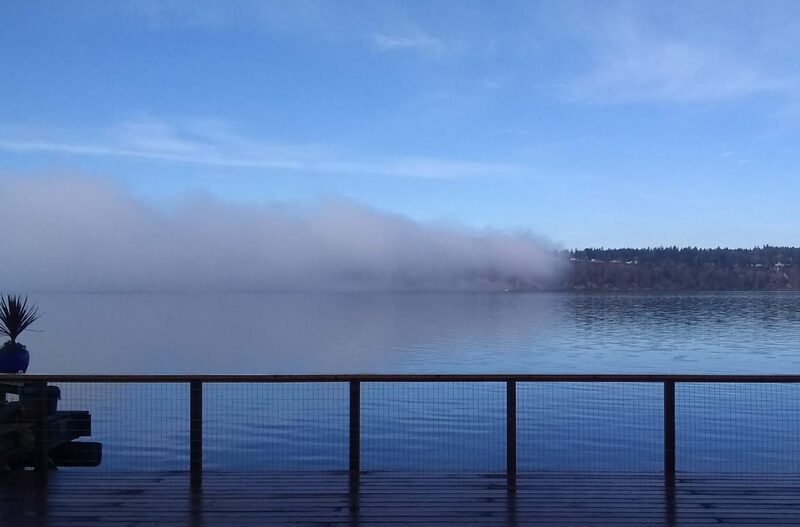 Here is the view yesterday late morning as the fog moved in. Hi Jim, lovely photo. That is so exciting to be with your kids while they are having a baby. Lisa and I have been with ours during the birth of our grandchildren. It is such a special time. The Kingfisher’s scientific name is Ceryle Alcyon. Alcyon was the daughter of the wind god in Greek mythology; she and her husband were transformed into a Kingfishers. I hope you and Melanie have a wonderful visit. All of our best to everyone. Hi Carol, female Kingfishers, like phalaropes, are larger and more colourful than the males. Birds are almost always the other way around. We always called the snowy mountain Baldy. It is a hefty walk to get to the top but well worth it. The last time we were on it was a couple years ago and it got foggy half way up and we turned back. We were ‘cowardly’ but, I know from reading your blog, you would have kept going. Take care. Exquisite photos, Bob, some seemingly almost otherworldly.